You can "adjust" a stock fpr but you have to be carefull because once you "crush" it you cant go back down, so I try to "sneak" up on the base fp I am looking for. A socket and a vice to push the top down has always worked for me. Yeah, I'm cheap. The other stuff has already been mentioned. Get a maf translator and newer style maf or you will be chasing your tail. Or see if your reman unit gives a full 255 when going wfo when you get a chance. Probably won't. Those old injectors are probably junk. way better options. Plenty of used 42lbers with a chip for cheap. Another place you are just wasting your time. I know it costs so I've bought used on these things. I did give up and bought the translator new when one of the vendors was having a sale. I was never quick enough when a used one came up. Plenty of used maf out there. Wrecking yard is full of em for cheap. I usually pick up four or five when I make the crawl. The O2 should be moving up and down, except when you go WFO. This is where the cross counts are important. The count is each time the measured O2 crosses past 450. when you go wfo, Then you do want it to be where mentioned above, 720(kinda on edge) to 800 or so(lean is mean but also much easier to get into detonation if something goes wrong). Your fp should be what ever your boost is plus your base fp psi. If it isn't you have a delivery or fpr problem. This is where a gauge mounted outside the car(taped to the windshield or if you have the budget a gauge mounted out there(never in the interior unless you are using an isolator. You don't want fuel spraying around in there with you in the event of something going wrong)). Sounds like you are making MAD progress, keep up the good work. 1) I'm feeling more confident about the injectors being the large portion of the idle issue. What are the forum's feeling on stock -type replacement injectors using the stock chip, vs. the injector/chip combo? I'm frankly nervous about replacing the chip and programming (I don't even know what that means). What about low vs. high impedance? I'm not sure my new wiring is compatible with non-stock impedance levels. Accel offers a six-pack of EV1s rated at 30 lb/hr that are listed as direct replacements, confirmed by Holley tech this afternoon. Or alternately Standard Motor Products stock replacements? Ultimately I'm willing to spend a little more for injector/chip combo if I'm confident I can install them with my level of understanding and existing parts. 2) As far as the MAF, I'm gathering that this would be more of an issue at WOT? What concerns (driveability, damage etc) would I have if the MAF I have failed to reach the 255-level? MAF issues can affect normal driving. It can run like crap. At WOT if there are drop outs you can go lean and do damage. There is no big deal to change the chip, pull out one, install the other. The modern chips usually have less timing for 93 octane vs the 100 that was available back when. The chip will be burned for your combo and they are pretty darn accurate for the tune. Stock ecm is set for high impedence (highZ). It can be modded for lowZ but not needed in your application. TT has his chips zeroed in for all the injectors now. Not a problem running all the way up to 80s. I would go straight to 60s. They are great injectors and have plenty of head room for upgrades. Biggest issue with injectors is making sure you don't pinch the O rings and making sure the plug is fully pushed on. if the maf can't get to 255 it wont be measuring accurately. It is measuring in gram/sec of air moving past it and if that is not accurate you aren't getting accurate fuel. Garbage in Garbage out in computer speak. When it isn't getting the fuel it needs lean conditions and detonation are not far behind. Broken engines and replacing head gaskets aren't that fun. The newer mafs are way more robust and if it goes, way cheaper to replace. The rebuilt stack stuff is known to be inaccurate. Good for the concourse crowd not for the guy who wants to stretch that car out and see what it'll do. As far as injectors I guess I thought your are running a stock computer? If not I really don't have a suggestion. If so, as above High Impedance unless it has been modded for the low kind. If you are into new stuff, turbo tweak has packages for chip/ injector combos. Lots to choose from. I'm just fundagely impared so I went used. Lots of people going to 60s and 42lb injectors will take a car pretty far for much less money. Vaseline, trans assemblee lube, grease on the orings to get em slid in without pinching works well. Just have to be gentle under there. This stuff is thirty yrs old and some is quite brittle. As far as difficulty, you are way past that if you are swapping engines. A few fasteners,the injector harness and the fuel lines, pop the fuel rail off. pull the injectors from the rail/intake, where ever they ended up. lube up the new orings and put it back together. Might consider a new fuel filter since you have the next injectors in there. I am using the stock computer, but not the stock harness. 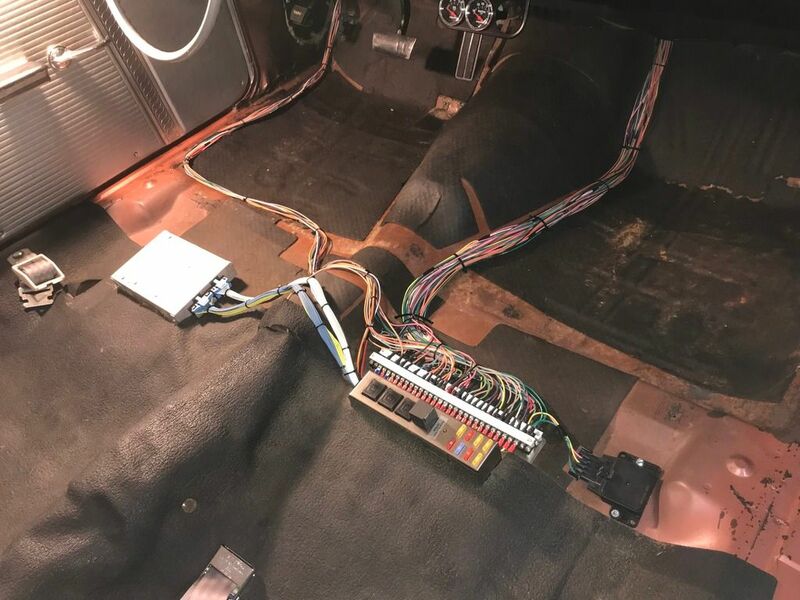 I sold the stock harness and went with a a kit from Ron Francis Wiring that essentially, for lack of better description, is a huge junction box. The sensors run individually to the box, and it distributes the circuits correctly to the stock computer. As far as load handling of the injector wiring, I'm assuming it's close to stock, which is why I wanted to keep stock impedance levels. See photo below for details. Thanks for the heads up on the MAF/translator. Looks like it's time to start saving for more expenses. Wish I'd researched that topic a little more beforehand, since I paid $100 for a stock MAF that I won't be using now. Keep the stock for MAF for now I have a good one I will lone and a set of almost new 42 so cheap you can’t believe with a TT street chip was for a stock cam and heads with a 5857 Turbo it might even work . PM me for the deal of the day prices. What do you think will that chip be ok our way to rich for him? The wires don't control high or low impedance injectors. In the ecm the injector drivers are what are different. The stock ecm can be modded to run the low impedance injectors. They are typically high volume injectors which you won't need. You should be good. You might consider a fresh injector harness at the fuel rail. It probably would be worth it to at least ohm the harness out to verify you have clean power to the injectors. Would probably need adjustment as the turbo isn't supplying near as much air being smaller and such. Just have to get it running and see about the O2. I'd probably take off 10% fuel and work from there. Just have to watch for knock and not lean it out too much. Probably would idle and do midrange but wfo is a different story . One way to find out. or just get the right chip burnt. I just saw a picture of the MAF you have pictured in another thread. That is not the correct MAF for a '87 turbo motor. That is most likely your problem. Hmmm, I'll look at it this evening. I can't quite make out that little photo, but mine (from memory) looks the same? If it is wrong, I'm not happy, as this was listed for my application in the source from which I bought it, at the time I placed the order. Link is below. It is currently showing as NOT AVAILABLE on Summit's site, with no application information listed. But this is where I ordered and received on May 29 this year. The plug is in the wrong position. Dead give away. You might want to look at vendors here first for parts. They usually have the right stuff and can give advise as well. Summit is usually pretty good at returns, if they have provided a part for an incorrect application. My problem is, I have run the car and no longer have the box. Plus, they're website has changed with regards to application of the part they provided - it no longer lists the 86-87 GN under "applications". We'll see what they do. Well, Summit will refund the part under "warranty" (good for 2 years from date pf purchase), if indeed I determine that is the issue. I have some injectors that I'm gonna try as well. Looks like my best bet for a MAF is a 3" LT1-style with a translator? Yes. At least you can still get a good maf. The tb mafs are long out of production. If you change the injectors be sure you have a chip that will work with them. Regarding matching the chip to injectors, what is the tolerance in lb/hr that a chip will operate? For example, stock injectors are rated at 28 lb/hr. Will the chip operate with, say, a range of 26-30 lb/hr? If you have a stock chip then run stock sized injectors. I think you can go to 30s on a stock chip. Anything larger you need a chip burned for them. The usual next step up are 36s. The Ford "blue tops" are nice injectors. I ran them for a while with a matching chip and they were fine.